Jonny from Evorack has sent in an exclusive and limited offer for 60% off of all their Xen packages! The coupon code for this offer has only 75 uses, so be quick to grab a box! Evorack is owned by the UK-Based ABPNI Computer Solutions Ltd, which was established in 2007. These offers are come with native IPv6 and you get a /64 with it for free. Custom kernels are supported, as all the servers use PyGrub. The servers have 1Gbps uplinks and host nodes are connected to various fiber links. 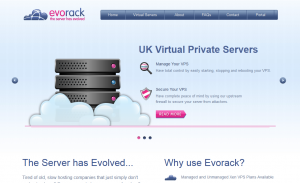 Evorack has servers in the UK in the Redstation DC and in the NewNet DC. A managed firewall is included for free! Payments can be done with either PayPal or credit card, for other payment methods you could contact Evorack’s billing department. Additional IPv4 are priced at £2.50/month ($4.06) a month and need to be justified. There is a 10 day money back guarantee is case you’re not really satisfied with your server. Also, please read their Terms of Service before ordering. 350MB Xen VPS has 2 disks? Also, that offer is no longer listed on our site (well, I’ve commented out the HTML anyway), so I’m curious as to where you saw that? Few days ago while looking for reliable UK VPS. As you will be aware, IP address are running short around the world, so we have to charge extra for them. This is in-line with most other providers. I have had an EvoRack vm for atleast a year, and it has been reliable and pretty speedy. About the only thing I have noticed, is the CPU usage on the VM is much higher than my other VM’s of the same spec — only thing I can think of is there is another VM on this host that is using lots of CPU and the usage numbers are skewed. Otherwise, solid host and have responded to questions quickly. Still have to wait 3 days for reinstall and similar tasks ? I’m sorry that this was your experience. As has been mentioned, our parent company has made a financial commitment to growing Evorack. Along with hiring new staff, we are now offering Live Support and are increasing our customer engagements to increase customer experience as well as to provide a faster response times to support queries. Just to let you all know, Evorack is pleased to be able to offer the latest versions of Debian Wheezy 7.2, and CentOS 6.4, both in x86 and x86_64 versions.